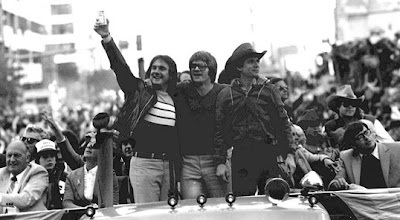 Here is a 1980 parade shot of Tug, Rose & Bowa... Notice the can of Bud in the Tugger's hand! I went for a 10 mile run after our oldest son's last soccer game. We left Boston early, so we could be home for his game. It was great weather for a run, low 60's slight breeze and sunny. I ran to Veteran's Park, and did the Hangover 5 mile loop. There were a bunch of soccer games going on, dog park was packed, as was the children's playground. Seemed everyone was out enjoying the beautiful fall day. On my home from the park, I passed Shoreturtle. I knew exactly where he was headed. My run, I decided to try and do the 10 miles at 8:30 mile pace. I felt really good, even after the drive home from Boston, and getting little sleep, as I was upbefore 7:00am, after staying up to 2:00am, watching the Phillies game. I have 6miles scheduled today (Tuesday), but this weather outside is nasty (wind chill's in the high 20's, wind gusts up to 25mph & it's a snowy/rainy mess!). I went for a wicked hard run, with my sister in law, Saturday morning in Beantown. Well, maybe not that wicked, or hard, just fun! Here, in the distance, you can see the World famous CITGO sign at Fenway Park. It was a nice morning to go for a run. We ran down Newton St, and weaved our way along to the Harvard Bridge. We ran along the Charles River, on Memorial Drive. There were a few runners out, and a cyclist or 2. As we ran towards Boston Commons area, and I made sure we avoided the hills around Beacon St. The Boston Commons area is a really cool park, in the heart of Boston. We ran thru part of it, and headed out, down Commonwealth Ave.
She was afraid she would be too slow to run with me, but it wasn't about running fast, it was all about spending time with her, and seeing how far she has come in a short period. It was really cool to run with my sister in law. She has got a touch of the running bug. I think I might have something to do with that! She has been doing awesome, and is building a nice base of running, so she can run the 10miler part of the Ocean Drive Marathon with me next March. Her other goal, is to hop in and help pace me the last few miles of the Philly Marathon. I think it's really cool & supportive of her and her husband, to come down, and be part of my 1st marathon next month. She did great, and I was really proud of her. We talked during the run, so I know it was tough on her. Our splits where very consistent, you can see the one time we had trouble with traffic. I had to be in Philly today, for an afternoon meeting, so I planned to run the 2nd 1/2 part of the Marathon course. I felt pretty good for kinda doing an unscheduled 12.5 mile run. Only had 6miles planned, but since I wasn't sure when I would get this chance again, I decided to do it. The weather was perfect, in the high 50's, slight breeze, and plenty of sun. I wanted to get a feel for the course, and see what hills there where. This course is flat, but not pancake flat as I have heard it called. I ran along the Kelly Drive, to Manayunk and back to the Art Museum. I did purposely skip a little loop, and part of the run on Ridge Rd. There was too much traffic, and it just wasn't worth the risk. I also took along the camera, so for those of us doing Philly, can see this part of the course. It was very scenic, as you run along the river, on Kelly Dr. There were a bunch of runners out, the crews were practicing on the river, and the damn cyclists where flying around. Let me soapbox for a minute. These damn cyclists think they are Lance Armstrong, with their "uniforms" on,weaving in and out of runners & walkers. I mean share the path, there is plenty of room for all of us. They act like they own the place. It did seem like it went pretty quick. I started around the 15 mile mark, ran to the turn around point at 20, and headed back. It was a bit hilly around Manayunk. Manayunk is a cool little town, with some nice stores & restaurants. Where you enter into Manayunk, it wasn't as developed, which I was kinda surprised. There was a strip mall with an AMC theater, and warehouses. Downtown will be fun during the marathon, but you don't spend much time there. If I ran the course correctly in Manayunk, it will be a tight turnaround. It looked like you just turn around in the middle of the street. I could be wrong, but that's the way I read it. There are parts of this loop, where it will just be us runners. Those will be tough miles on Kelly Drive. Here's a picture of me, running along. I stole the idea from Ted & Shoreturtle! I was glad I did this today. It gave me a good feeling that I'll be ok, on this part. From the entereance into Manayunk, to the finish, those last 6-7 miles, will be tough, and just a bit hilly, hopefully I'll be the better for running this today. Here is a shot at the fountain at LOVE Park. The colored the water Phillies RED! Man was it a blustery run! The winds must have been peaking at 25-30mph here last nite. Luckily it was kinda a cross wind, so I wasn't running 6+ miles into the wind, nor having it aid my run, by having the wind at my back. The legs felt pretty good again last nite. I have had a bit of tightness in the left calf the past few weeks, but nothing major. I feel fortunate that I haven't had any major training issues. I keep tabs on other runners, doing the Philly Marathon, over at the Runner's World discussion board, and it seems like the last few weeks, people have been dropping like flies. Hard to believe that just a few days ago, I was running in shorts & a tank top. Today, I was out the door, around 8:00am, and it was 40deg! I ran in running sweats, a long sleeve pullover and gloves, for the 1st time since probably early April! Quite a difference, I'd guess about a 30 deg swing in temps from my last run on Wed! It felt odd to have that much clothing on, but I felt good doing my 8 mile run. One thing I did this week, that I haven't done my entire marathon training, happened Thursday. I had a scheduled 6miler, and just wasn't feelin' it, so I said "F" it. I did feel guilty afterwards about not running it. Skipping that run, helped the legs, and I felt pretty darn good with both runs this past weekend. Saturday I ran 4.55miles in 38:49mins. Nice easy week on tap, and I have a few things upcoming that I'll bring to the blog later in the week..
Holy Mike Schmidt!! 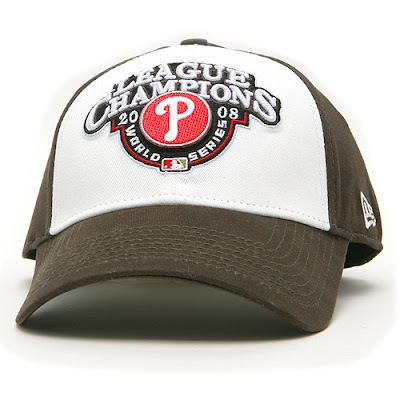 The Phils are headed back to the World Series for the 1st time since 1993. 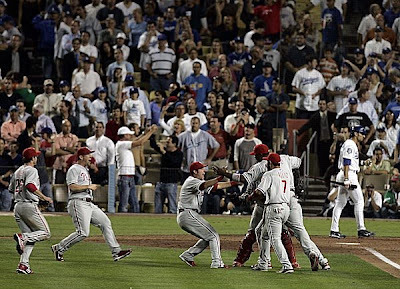 I know Philly gets a bad rap in the media, as a city of holligans, who throw batteries at players, snowballs at Santa, beat their wives, ect.. but last nite, when the Phils won, the fans went crazy.. parting in the streets, and there were NO ARRESTS! No car fires, vandalism, no nonsense that you see in other cities when teams win pennants or championships. Kudos to the Phillie fans for having fun, and not giving the great city of Philadelphia a black eye! Now, think back 15 years, and think about who you where then, and fast forward to today. In 1993, I was 27, dating my future wife, and just bought my 1st house. I was playing a ton of competitive street hockey, and not running. Hitting the bars every weekend, just enjoying the care free, little responsibility lifestyle that you lead in your 20's! Now 15 years later, I've been married for 13 years, and have 2 sons, lost my mother, bought and sold my 1st house. We've been in our home for 12 years now, and bought a shore house just about 3 years ago. I have spent the better part of 2008 training to run a marathon. I play the occasional street hockey game, but enjoy coaching my oldest son in the sports he enjoys! I know it's cliche', but enjoy today, because to quote John Mellencamp "Days turn to minutes & minutes to memories...". Looking ahead, maybe we'll talk about what was going on in 1980, IF a championship happens. But after all, this is Philadelphia we are talking about, so the bottom is going to fall anytime. Anyone who was watching the games in LA, are you as happy as I am , that I don't have to look at Mary Hart anymore?!! Her, Pat Sajak, Penny Marshall, they got probably more airtime than Manny did! Good riddance to them! With the weather forecast for highs in the 70's this past weekend, the wife & I made and executive decision to head to the beach! So with this being Columbus Day weekend, and the last weekend the piers would be open, off to Wildwood we went. It was perfect weather, it felt more like Memorial Day weekend, not Columbus day in Oct. The highs Sat & Sun where around 72-73deg, with a ocean breeze coming from the Northeast. It made it a bit chilly down by the ocean, but all in all, awesome weather, with no crowds. It was as if the beach was ours. We even took our dogs on the beach & boardwalk Sunday. I had a 4 miler to do on Saturday. I got up and out a little after 6:00am both days. On Saturday, I ran the boardwalk, the last 2 miles. What a difference from the summer. The place had that eerie quiet to it. 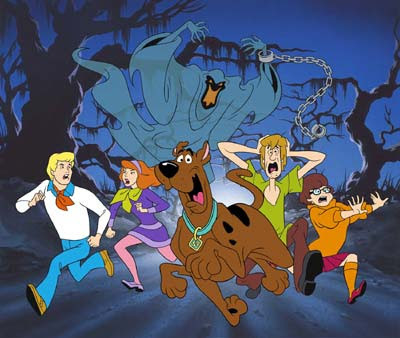 Kinda like a closed up amusement park, in a Scooby Doo cartoon. Sunday, I was up at the same time, and out the door to run 14 miles. Being downashore, I did the old out and back loop into Cape May. I must say, I wasn't looking forward to the run. Guess I still had the memory of the fall, fresh in my head. The past week, I haven't been "feelin' " the running. Guess the 5 days a week of training, are starting to take their toll on the psyche, not to mention the legs. While I didn't feel all that well running, my times were dead on what I want to run in Philly, come November. There wasn't much of anything going on, on the run. Most places where closed up for the winter. That's a shame, because, like I said earlier, the weather was as nice as Memorial Day, if not better. And the bonus is.. no crowds! I should hope to feel that bad, with splits like that in Nov. Guess it wasn't as bad as I thought. Back to the grind this week. It's the 6-8-6 mid week milers! Hmmm.... maybe a race to swim on Tuesday?! I've been tagged by Beachrunner411 & NCrunner12. Well, I need to tell you 6 things about myself. When I was a freshman in High School, our track team ran against Carl Lewis in Willingboro,NJ. While I personally didn't run against him, I was there watching teammates compete against him. Who knew he would become one of the greatest ever. I met Flavor Flav in 1988, in Chicago, at about 4:00am, as I was coming in from the bars. He was in front of me on the escalator, I thought it was him, tapped him on the shoulder and asked him if he was FF. He turned around, took off his sunglasses, and smiled (with gold teeth & clock) and said "That's me G!". I spent the next hour drinking with Flav at the Hyatt bar. I am a lifelong fan of the Flyers & Phillies. I actually remember the Flyer cup wins! (I was 8 for their 1st win). I'm now 42, with 2 boys, waiting for #3!! I was at the 2001 Daytona 500, when Dale Earnhardt died. You knew it was bad (yellow caution tape around the car was a sign), but you had no idea he had died. I enjoy reading biographies, and actually read the Regan Diaries. 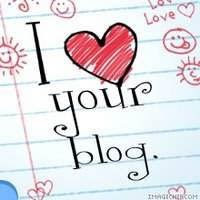 I didn't think I would enjoy "blogging", but it has turned into quite the experience. I think it has actually helped with my running. Here are 3 people who are tagged! Shoreturle, Ted & Progman2000! Today I went to Veteran's Park, to get my 5 mile run in. Well, guess who was waiting for me? A friggin' rotty, again, no leash and no dog tags. How do I know this? Well, Rotty came charging at my car, chasing a squirrel into the brush around a baseball field, where I was parked to change. I must be a magnet to this breed. What is with people, that go to a public place, and have no leash or tags on their dogs? I mean it was right next to the dog park, let the beast in there to roam around. Well, other than having a rotty running around, there wasn't much action in the park. There was a high school cross country meet, getting ready, but no weaves falling off girl's heads. The legs have been a bit sore, since the 21 miler on Sunday, so I was glad to feel pretty good today. I did push it a bit, since I felt good. Maybe it was running in the new shoes? Many greats in the world of sports are associated with the number. Peter Forsberg, LaDanian Tomlinson, Sammy Sosa?, just a few who wore the number. One of the best card games is "21". You can legally drink at "21". Now you can add yours truly to someone who has run 21 miles, not total mileage for a week, but 21 miles, with only a stop to refill a water bottle. I got out of the house around 5:20am. It was 54deg. I was expecting it to be cooler. I am not complaining, since the last 20 miler started in 74deg temp w/ 100% humidity. The route I chose was the same as the 20 I did. I knew by not cutting any corners, I would be close to the scheduled 21 miles. Everything was going according to plan, until I got around the 4-5 mile mark, when outta the pitch black came a friggin Rottweiler! This damn dog came at me, barking big time. I thought for sure he was going to attack. I stopped, screamed at it, and it retreated back to where it came from... so I thought. Well, I start running again, and it comes back! I freeze scream at it, and it again retreated. I than kinda jogged, looking back to make sure it wasn't going to come back again. I'd love to know if it was loose, or if the owner was with him. I mean where the hell does a dog like that come from, before 6:00am. I got passed at one point by 3 cyclists. The lead cyclists asked why I was running this early. My answer was why was he cycling this early! I did yell to him afterwards, that I was training for a marathon. I had planned earlier in the week, and confirmed last nite, to meet up with Charlie (shoreturtle), around 7:00am, to do an out and back , thru Mercer County Park. I figured to be close to 10 miles, when I met up with him, and I was just over 9, at 9.2 miles. I felt good for the majority of the run. The legs started to fade at about the 20 mile mark. I felt tightness in the hamstrings. Still I made it to the end, accomplished 21.17 miles before most where out of bed, and lived to tell the tale of a rottweiler coming at me in the dark! A little FYI... I didn't run in my new Asics today. I'll break them in on my weekday runs. 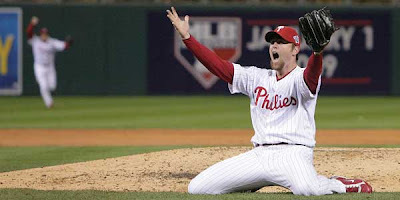 CONGRATS to the Phillies for making it to the NLCS for the 1st time since 1993! Yesterday, I broke down and bought a new pair of Asics Gel Kayano 14's. The last week or so, I have posted about the legs & feet hurtin a bit, and I could tell I was due for a new pair. This is the quickest I have ever gone through a pair. I got my last pair, for Father's Day, and here it is not even 4 months later, and I needed a new pair. Now Saturday, was a 4 mile day, so we can check that off the title to this blog. Explained the new shoes... check. Well, when I went to put on the Garmin, it was DOA. When I set it on the table last nite, I must have placed it, so one of the function buttons where hit, and it wasted the battery. When I saw it was dead, plugged it in, and started the charge. Well, I had my trusty old (key world OLD) early 90's Timex Ironman watch, ready to go. So, before I left to do my run, I checked the Garmin, and it was 10% charged. I figured, 10%, 4 miles.. it should be good to go. Being a bit cautious, I decided to also bring along the Timex, just in case. I know it's only a 4 miler, not a high mileage run, or even a race, so why go nuts? That's just me. I had to know my time and make sure I ran the 4 miles, even though the route I chose, I had done many times before, and knew it was 4 miles. Well, the Garmin & Timex both kept the time, and the Garmin was chirping "Low Battery" at me after 2 miles. I did the 4 miles in 37:00 mins. AND as soon as I got done, I plugged the Garmin in to charge. I need that bad boy for the 21 miler tomorrow (Sunday). Oh FYI.. I will leave it plugged in overnight, no way am I running without it! It's been a pretty easy uneventful week of running. It is very welcome.This is the 1st week, that I have been feeling it in the legs and joints. I guess the mileage and running 5 time a week, since early July has caught up to me a bit. Once I get started running, I feel good, but getting up in the morning has been tough. Guess this is part of the price you pay, to run a marathon. Tuesday I ran a 5 mile run. Nothing special, I took the wife's van to the local tire shop, to get an oil change, give it the once over, and I put my 5 miles from there. I ran a relaxing pace, 5.03 miles, 43:05mins. Today, Thursday, I ran 6 miles in Veteran's Park. I wanted to get the run in before the Phils game, which started at 6:00pm (thanks MLB & TBS.. all about the $$). Again, it was a pretty uneventful run, no weaves falling off girl's heads, or cops chasing me up a hill. No cross country meet. No deer in the woods, or wild turkeys running wild. It was nice to run in very cool comfortable weather. There was a steady wind, but very manageable. I ran 6.01 miles, 53:35mins. Saturday, I have a 4 miler on tap, and Sunday is the big one, 21miles!